If you listen to people like Rush Limbaugh, there was a battle brewing in the House, with Democrats fighting over the Democratic leadership positions. "Racist" is what Limbaugh called it. Here's how Limbaugh broke down what he called the "Steny Hoyer and Clyburn, Hoyer wanting Clyburn to go back to the back of the bus, leadership battle." "So there you have it. All hell breaking loose in the Democrat Party because now black and brown people [are saying], 'Tonight we on the inside, we wanna get in there,'" Limbaugh said. "The white racist leadership of the Democrat Party is trying to ace out Clyburn." Clyburn has had power, but they want to take it away from him here. Tavis Smiley is not down with this. Clyburn starts to demand respect and all hell seems to break loose in the Democrat Party. Hey, I have a suggestion. You know, I like to mediate these things. I like to bring people together. I like to unify people. I don't like seeing this kind of strife. Clyburn's worried about not having the car. Clyburn's worried about not having the perk of a big office, driver, and so forth. 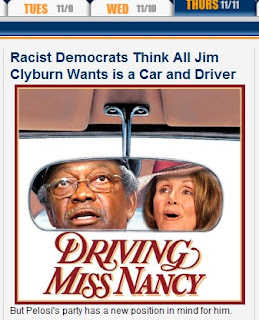 The way this can all be worked out, Clyburn's new position: Driving Miss Nancy. He gets to keep the car. He gets to go everywhere she goes, parties and everything else. He's not in the back of the bus. He's in the driver's seat, and she's in the back of the car being chauffeured. Solved problem. Not only is Limbaugh's analogy and language offensive - where is the conservative outrage against Limbaugh's "back of the bus" comments - Limbaugh is totally wrong. Conservatives would want to manufacture a Democratic split for political gain and to draw attention away from their own political problems, like the incoming tea parties clashing with the establishment Republicans over things like earmarks,or the challenge against Michael Steele to head the Republican National Committee. House Democrats averted a messy leadership struggle, clearing the way for Maryland Rep. Steny Hoyer to become second in command of their new minority without a challenge from South Carolina Rep. James Clyburn. Under an arrangement worked out in private, officials said late Friday that Clyburn would instead receive a new position, title unknown and duties undescribed, explicitly labeled the third-ranking post in leadership. The maneuvering was described by Democratic officials after Speaker Nancy Pelosi, D-Calif., issued a vaguely worded statement saying she intends to nominate Clyburn to a new No. 3 post. The statement made no mention of Hoyer, and officials who filled in the details did so on condition of anonymity, saying they were not permitted to speak publicly about the matter. Pelosi is assured of remaining Democratic party leader when the new Congress convenes in January under a Republican majority. She has drawn no opposition for the post even though several members of the rank and file have said they would prefer she step aside after historic election losses. The GOP gained at least 60 seats in midterm elections, more than enough to return to power after a four-year absence. A race between Hoyer, D-Md., and Clyburn, D-S.C., for the post of party whip took shape in the days following the election and quickly took on racial overtones. Clyburn is the most powerful African-American in Congress, and he drew a formal endorsement from the Congressional Black Caucus. But he failed to generate enough additional support to overcome Hoyer's strength among liberals and conservatives alike, and it appeared his only options were to run against Hoyer and lose or else concede the obvious and step aside. I highlighted the last paragraph for a reason - it states that basically, while Clyburn is an African-American and has support from the Congressional Black Caucus, Hoyer has even more support. Limbaugh seems to argue that Clyburn should get the position solely on his race. That sounds like affirmative action - something Limbaugh is totally against. "This is affirmative action, if we do that," said Limbaugh about President Obama last year. "We want to promote failure, we want to promote incompetence, we want to stand by and not object to what he's doing simply because of the color of his skin?" How about his comments against then Supreme Court-nominee Sonya Sotomayor, calling her an "an affirmative action case extraordinaire" and that she favors Latina women over white men? If you go back, you can surely find numerous quotes by Limbaugh attacking affirmative action, so it is peculiar that he now he supports it - when it benefits his political agenda. Sounds as if Limbaugh wants to be the one who benefits from affirmative action - Clyburn was an effective party whip, so to be promoted and leave that position to someone who may not be as qualified or effective would essentially hand more votes to the Republicans - something Limbaugh would most surely want.